A small plane with 23 people including two foreigners on board goes missing in Nepal, when the plane was flying in poor visibility over mountainous terrain on Wednesday, and officials fear it has crashed. Airport official said the plane was on an 18-minute flight Wednesday, but lost contact after takeoff. He said there were no landing strips between the two airports the plane was flying between and it is believed to have crashed. Helicopters were searching the route more than two hours after the plane was to have landed, but poor weather conditions are making that difficult, he said. The foreigners were from China and Kuwait while the remaining were all Nepali nationals, including two children. The plane had taken off from Pokhra, a resort town 200 kilometers west of Kathmandu, and was heading north to Jomsom, the starting point for trekkers going into mountainous areas. The police chief at Jomsom, said they had reports from local villagers of hearing a loud explosion near the small village of Rupshe and attempts were being made to reach there. 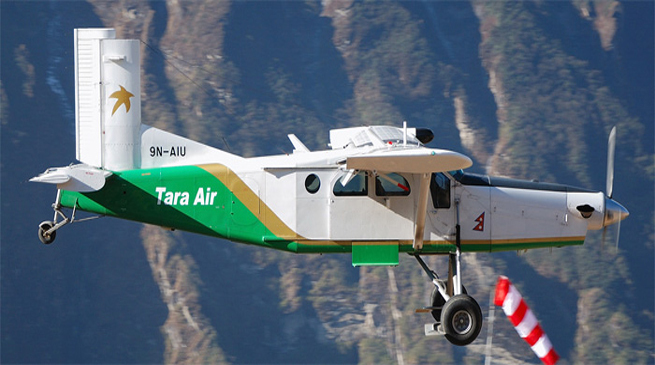 The Twin Otter aircraft was operated by domestic Tara airlines. Only small planes can fly the route, which goes between mountains. Jomson is popular for both foreign tourists visiting the Mount Annapurna and Mustang region for trekking, and for Hindu pilgrims visiting the Muktinath temple.